If you don’t have an automatic turning incubator, you should turn your eggs about 3-5 times per day from the second day onwards. It is important not to forget to turn your eggs and some people remember to do it after every meal. You should not turn your egg after Day 18 which is two - three days before the chick will hatch. This will give the chick time to position itself properly for hatching. 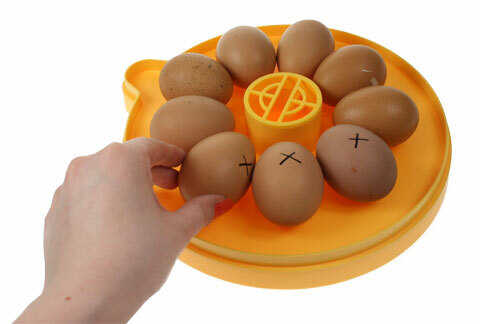 If you have marked your egg with an X on one side you can easily tell if you have turned your egg or not. You should remove the lid of the incubator for as little time as possible. However, don’t rush and make sure you turn the egg carefully without jarring them. As you move them around the temperature and humidity of the incubator will drop but it will soon recover its temperature. Interestingly, an unfertilised egg will loose heat rapidly while a fertilised egg will not. This is how a hen know which eggs to throw out of the nest. Finally, when you turn the eggs manually, you should make sure that you hands are washed to avoid transferring bacteria and oil onto the surface of the egg. This website was very helpful. Thank you! I have an incubator that say it turns eggs but it’s not actually turning them. I took it upon myself to turn them a 1/4 turn & upside down. How have I affected my eggs?